Kochi, a major port city on the west coast of India, will host seven matches in the upcoming Indian Super League season at Jawaharlal Nehru stadium. Kicking off on October 15, the city will host matches through to November 30. 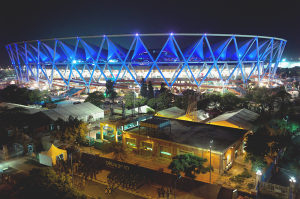 Originally constructed as a football stadium, Jawaharlal Nehru stadium is also the home of the Indian national cricket team, and Indian Premier League cricket. The stadium will be used by Sachin Tendulkar’s Kerala Blasters in the upcoming Indian Super League season. The 75,000 seating capacity makes it the second largest stadium in the country, behind Salt Lake Stadium in Kolkata. The early announcement of Kochi to host seven ISL matches may inadvertently run into difficulties, given the conflicting schedules of international cricket with the upcoming ISL season, and the short turn-around time required for pitch maintenance.